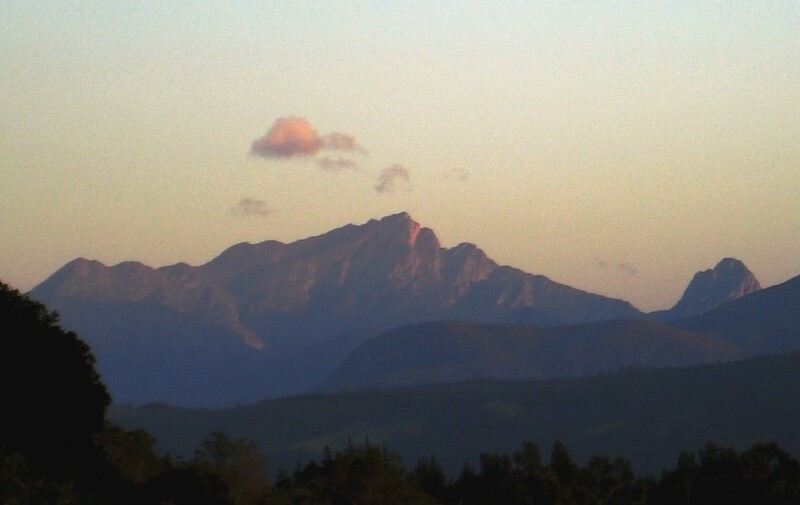 Our mountains, the majestic Outeniqua range! Between the town of George and the Tsitsikama forests, the ruggedly beautiful Outeniqua and Langkloof mountains drop down from the interior plateau to the coastal plain. The mountains capture the rain clouds that rise from the sea and in turn fill the many streams and rivers, providing life-giving water to large tracts of forest. The name Outeniqua comes from the Khoi word meaning ‘People with Honey’, as the Khoi people collected honey from bees feeding on the region’s wild flowers. The flowers of the Outeniqua Mountains form part of the fynbos, which makes up 80% of the Cape floral kingdom. The vegetation of the folded sandstone mountains and sandy coastal plains of the Western Cape is commonly known as fynbos. This is an Afrikaans name that refers to the small, delicate leaves of many of the species. Although the soils of the mountains and coastal plains of the Western Cape region are low in nutrients, an estimated 6800 species of fynbos plants survive here. Fynbos species comprise 80% of all plants found in the cape floral kingdom. This is the smallest of the world’s six floral kingdoms, covering just 0.04% of the earth’s landmass, yet it is one of the richest in diversity. An estimated 70% of the fynbos plants are endemic and some are so limited in distribution that they occur only on a single mountain peak. The forests that carpet much of the Outeniqua Mountains form part of the remaining 20% of that kingdom. These mountains form a range located along the Garden Route of South Africa. They run parallel to the coast and form a continuous range with the Langeberg to the west and the Tsitsikamma Mountains to the east. The range was named “Serra da Estrela” (‘Mountain of the Star’) on old Portuguese charts. 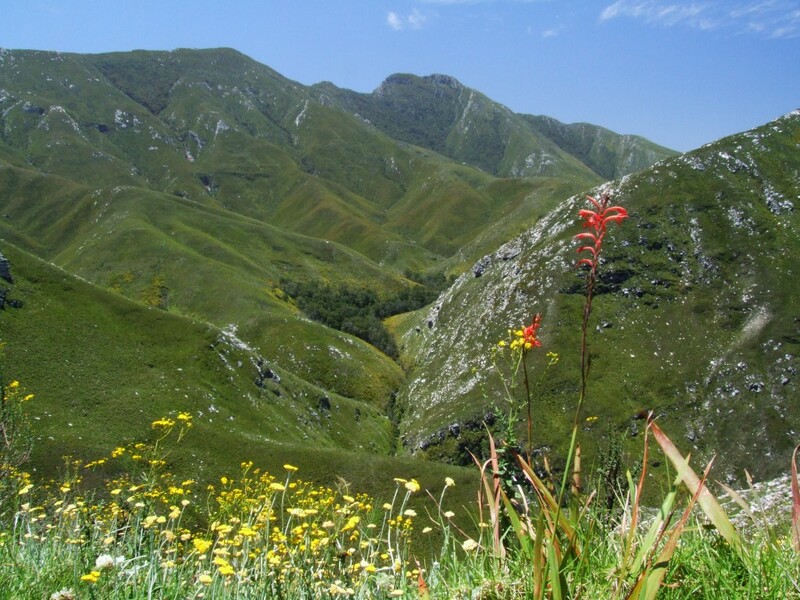 ‘Outeniqua’ is said to be derived from a Khoisan tribe that once lived in these mountains and means “they who bear honey”, as the Koi collected honey from the many swarms of wild bees that were feeding on the regions wild flowers. Rock paintings from the Khoisan people can still be found in the area. The range is characterized by gentle southern slopes and steep drops on the north side down to the low valley Little Karoo. 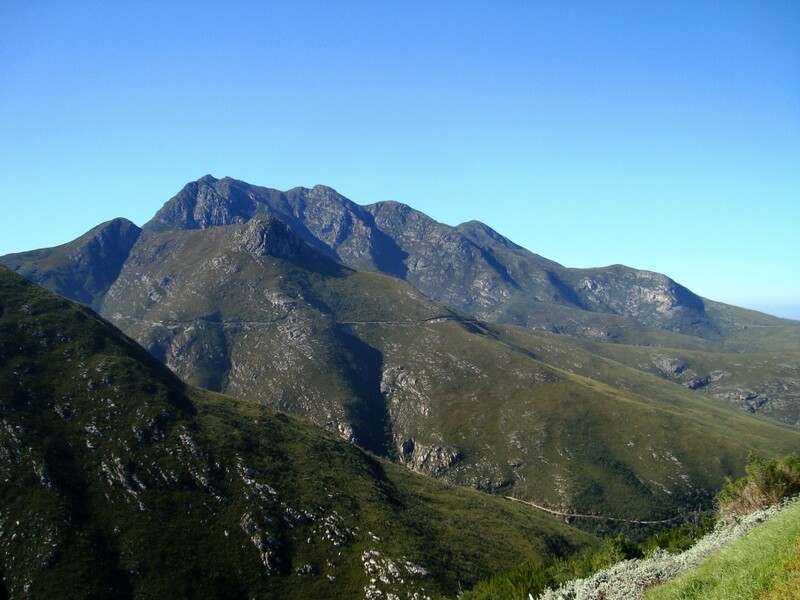 High points include Cradock Peak at 1578 m and George Peak at 1370 m located to the north of George. The varying conditions create diverse habitats. On the south-facing slopes there is montane fynbos at higher, moister altitudes, while the north hosts karroid and renosterveld shrubland. On the southern slopes there are Afromontane forests. The high rainfall on the range has created numerous perennial streams used for irrigation in the Olifants River valley. While the climate along the range is generally hot to moderate, with an average summer temperature of 20.5 °C, weather conditions can vary greatly. In winter the temperature can drop to 5 °C (and even lower on the southern slopes) and snowfalls may occur on the higher peaks. Among the animals found in the Outeniqua range are klipspringer, grey rhebuck, leopard and various rodents. The range is also home to a very small number of African elephants. Although described as functionally extinct, new sightings of these very elusive animals, including that of a young bull give hope that the fabled animals might with time become re-established in the Outeniqua reserve. Birds include black eagles and other raptors as well as the Cape sugarbird and other fynbos birds. The rugged Outeniqua mountains proved a huge hurdle for the early settlers who wished to move from the coastal regions into the hinterland. In the western part of the reserve, the Attakwaskloof, which was originally a thoroughfare for herds of elephants, was first used by settlers in 1689 to travel inland. The first road pass to cross the range into the Langkloof went via Duiwelskop, some 32 km east of George. In 1811 a new pass was constructed and named Cradock Pass after the Governor, Sir John Cradock. It was difficult to negotiate and became known as the ‘Voortrekker Road’. In 1847 a vastly improved Montagu Pass was constructed by convict labour, and named after the Colonial Secretary, John Montagu. In 1943, to cope with the increasing demands of modern traffic, construction was started on the Outeniqua Pass, using the labour of Italian prisoners of war. At the end of World War II the Italians returned home with the greater part of the pass unfinished. The pass was opened to traffic in September 1951, having cost approximately £500 000. Two other road passes cross the Outeniqua – The Robinson Pass west of George, and Prince Alfred’s Pass connecting Uniondale with Knysna. This entry was posted in From the Garden Route, Uncategorized and tagged Outeniqua mountains. Bookmark the permalink. ← Seven fruits and veggies a day? Here is some easy ways to sneak them in! 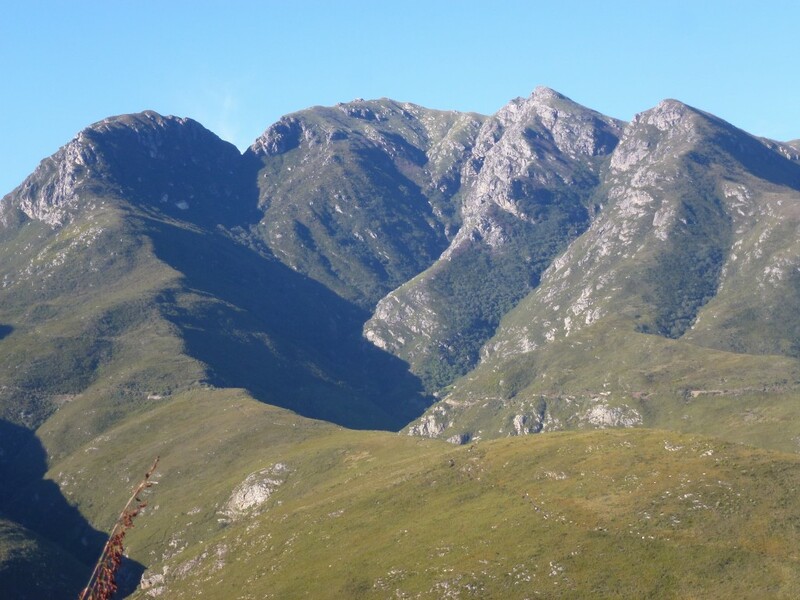 6 Responses to Our mountains, the majestic Outeniqua range! Please may I have your permission to use the pictures in this post for a blogpost on my Wonderfull Words blog. I would also like to have the name(s) of the photographer(s) for proper credits. I am writing the post on the setting for my new series which is set in part in the Outeniqua mountains. Thank you Maggie ~ From top to bottom, image 1 by DJ Lee, image 2 was found on Google, Image 3 and 4 Indigoblue. I would like to retire in that part of the world. This and the Swartberg range is beautiful. We can only agree with you Dirk. These mountains are proof that heaven is already here! Just think for a moment…….God created this for us to see and appreciate……….Thank You Lord.